You don't have to be sick to appreciate a bowl of homemade chicken soup. There are many different types of soup you can make with a chicken-broth base, but traditional chicken soup is one of the easiest. Customize the soup to match your tastes and preferences by adding a variety of seasonings, vegetables and noodles in addition to chicken meat. 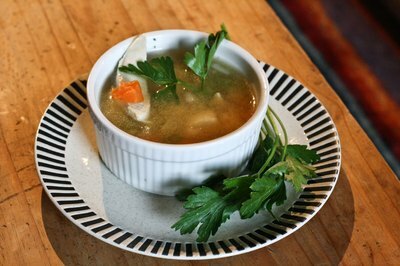 To save time, make a large batch of chicken soup and freeze some of it to enjoy later. Place four boneless, skinless chicken breast halves, one small chopped white onion, two peeled and sliced carrots and one stalk of sliced celery in a large saucepan. 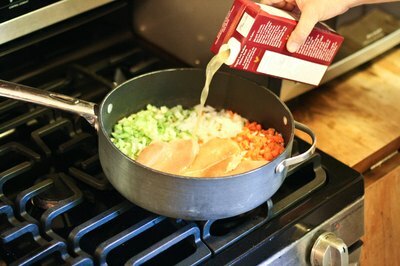 Pour 4 cups of homemade or packaged chicken broth over the chicken breasts and vegetables. Season the broth to taste. Include a few sprinkles of dried thyme, parsley, rosemary, chives, a poultry-seasoning blend or one bay leaf. Add the juice of half a lemon to the broth if you prefer a zesty flavor. Set the stove top to "High," and bring the broth to a boil. 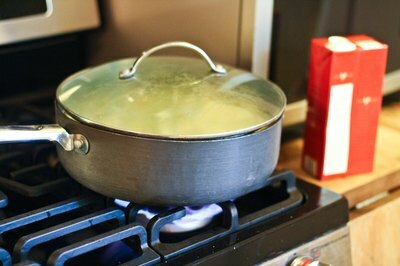 Reduce the stove-top setting to "Low" and cover the saucepan with a lid. Cook the chicken breasts for 20 minutes or until they are firm and white all the way through. Take the meat out of the broth and set it aside. Continue simmering the broth on "Low" for about five minutes, or until the vegetables are tender. Cut the chicken breasts into bite-sized pieces and transfer them to bowls. 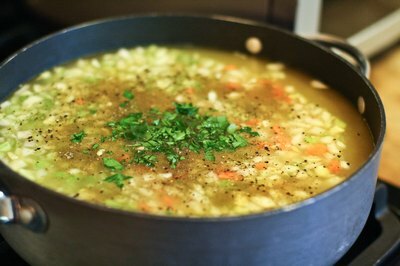 Remove the bay leaf from the broth and ladle the soup into the bowls over the chicken.